The film opens following three characters: Liu Kang (Shou), who wants to avenge the death of his brother Chen by the murderous Shang Tsung (CHT), Sonya Blade (Wilson) who is hunting a smuggler who killed her brother and has lured her into the tournament, and Johnny Cage (Ashby) a Van Damme-like movie star who enters the tournament to prove he’s the real deal. They make their way to an island owned by Shang Tsung (doesn’t the plot remind you of another martial arts classic? ), and meet his fearsome fighters: Sub-Zero, a ninja who has perfected a freezing technique, and Scorpion, a ninja returned from the dead with a grapple claw and fire breath, which I hear is standard fare for all resurrected ninjitsu warriors. They also have to face Goro, a six-armed 7 foot tall muppet, and Reptile, a lizard who can transform into a ninja fighter. They are all from another dimension called Outworld, ruled by their master Shao Khan. Our heroes are aided by Princess Kitana (Soto), the former ruler of Outworld, and Rayden (Lambert), the god of Thunder and Lightening, worshipped by the chinese monks for being a god of Thunder and Lightening. And a kung-fu master. And French. Liu Kang and his new friends soon find out they aren’t just fighting in a tournament, but are fighting for the fate of Earth, and each of them learn a valuable lesson about themselves in the process. Yes, this is truly a silly film, but it’s still fun, probably one of the better video game adaptations done. They rip off the plot for Enter the Dragon wholesale, but hey, someone was going to eventually. 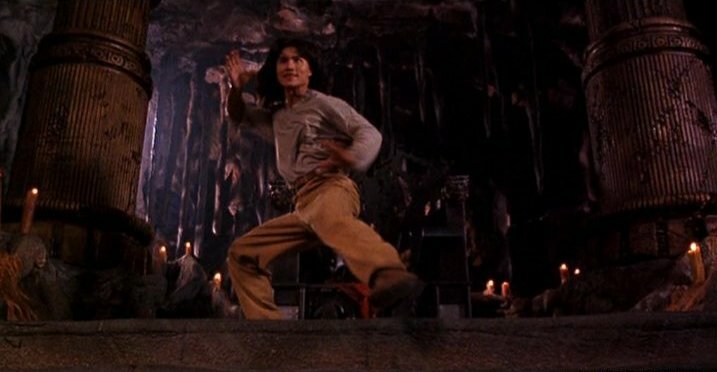 Robin Shou does okay for Lui Kang, but his acting leaves a lot to be desired. His fighting isn’t so great either. Don’t get me wrong, he’s not bad. His kung-fu is technically good, but he doesn’t have the grace and speed of Donnie, Jackie or Jet. Everyone else is cut from that same Hollywood cloth of actors who don’t really know any martial arts but has a lot of stunt people doing it for them. In the case of Johnny Cage some of the stunts are done by JJ Perry, the fight choreographer fromUndisputed 2, and Blood and Bone, and Keith Cooke, he of China O’Brien. Makes you want to jump up and give someone a tornado kick to the face! If anything, this film was a good mix of old school martial arts and special effects that had good and weak moments for both, but overall is an enjoyable film, but the soundtrack makes the film better than it actually is. CHOREOGRAPHY: (7) Good choreography for an American film, and could have been better if the actual stars of the film outside of Robin Shou and CHT (I don’t think he knows much) actually knew martial arts. STUNTWORK: (8) These guys had to hold up the actors who didn’t know martial arts and did a good job at doing so. The guy wearing the Goro suits deserved a raise. STAR POWER:(6) CHT is money in the bank as always, and Christopher Lambert is always a treat. Robin Shou doesn’t have the charisma to be a big star. Everyone else is fairly forgettable. Some of the stuntmen in the film went on to bigger and better things. FINAL GRADE: (7) One of the best video game adaptations ever, which is faint praise, but is a good check-your-brain-at-the-door film for martial arts film buffs. I remember this as being not too bad – Christopher Lambert was great, Robin Shou was ok and Brigitte Wilson was awful (I still remember the “Nooo!” she did when a fellow fighter is killed by Goro). I thought the designs for Scorpion and Sub-Zero were spot-on. Thought this film was alot of fun, the only thing i wished for as kid was that the fights were longer, fighters had more of the games special moves/powers and fights were more bloody. Im sure if a remake is made (like the fan film released recently with Michael Jai White) then it will fulfill my dreams. Funny you should mention that. 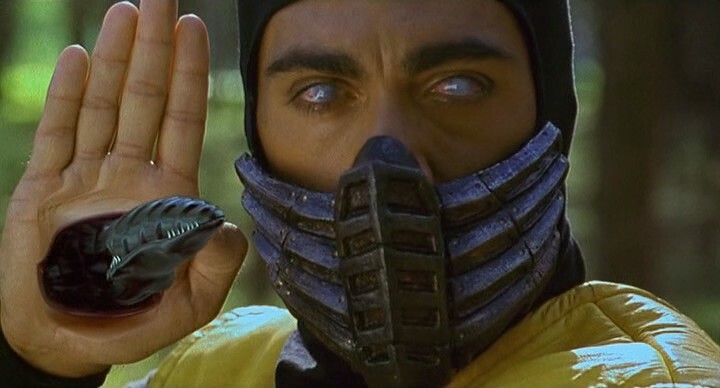 In my next roundup of news I do have something concerning a new Official Mortal Kombat web series…by the same people who did that fan film.